The Neckbreaker is your shot at proving just how low your car can go. We had to think long and hard about how we were going to level the playing field for cars with Air Suspension and for those with Coilovers so that everyone has the same shot at winning the competition. Each vehicle will have one lap around The Neckbreaker closed circuit track. There is a maximum of 5 passengers allowed in each vehicle competing. The ride height of the vehicle locked in with the limbo posts at the beginning of the competition must match the ride height at the end of the competition. Any change in ride height at any time is an instant disqualification. If the air suspension controller is not able to be hung outside the window, all passengers must have their hands visible at all times. Failure to do so will result in disqualification. The judges choose the top 5 cars based on the number of scrapes, ride height and crowd reaction. The winning participant is decided after a second pass through the Neckbreaker. The crowd judges who wins gold. 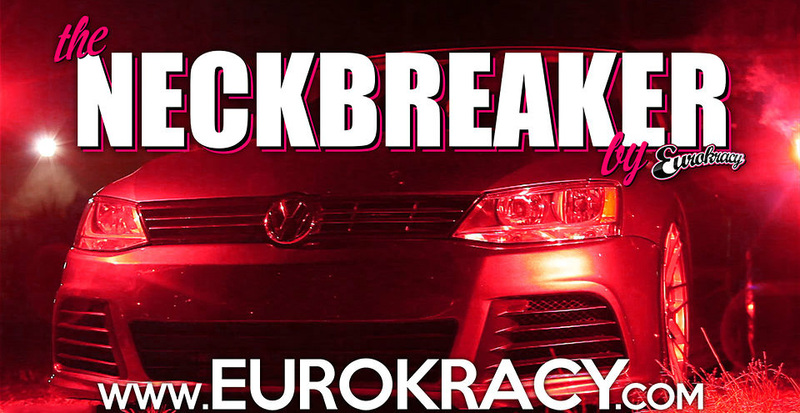 Enter at your own risk, Eurokracy organizers, staff or vendors are not responsible for vehicular damage, injury or death that may occur as part of competing in The Neckbreaker low-car competition. Hi , i wanna know can i come with my dog ? ?